I don't know if this has been posted before? But apologies if it has, but as is known the wooden gates at the entrance to the yard were closed, and this was apparently standard practice at night. However, according to Walter Dew access could still be gained through a small wicket gate.So perhaps local prostitutes were aware of this and it gave them a quiet location away from prying eyes to take clients for a "quickie"
I'm not sure why you think that it's known the gates were closed - all the witnesses who commented said that the gates were open at the time of the murder. Didn't the horse and cart just drive straight into the yard with the horse rearing back and stopping at the body? "The body of Elizabeth Stride was later found by a man called Louis Diemschutz, who turned his horse and cart into the yard and saw Elizabeth’s body lying on the ground." 'Turned his horse & cart', but didn't step down to open the gates BEFORE turning his horse/cart into the yard. It wasn't just Dew though, this sketch was published on the 5th Oct. - bottom left. "They accompanied him as far as a gateway with a small door in it, but when he stepped through and left his bag on the ground, saying he would take either of them with him, a feeling of distrust seized the women." This character should have been a Person of Interest. Nichols body was found outside a gate, but have not been able to find if it had a wicket door in it. Last edited by Wickerman; 07-24-2018, 06:35 AM. In fact, in his inquest evidence (according to the Daily News) says: "Both gates were open - wide open." I simply looked at the gates because they were open." PC Lamb: "When I blew my whistle other constables came, and I had the entrance of the yard closed. This was while Dr. Blackwell was looking at the body. Before that the doors were wide open." Edward Spooner: "As soon as Police-constable Lamb arrived, I went away, after helping him to shut the gates." "At the hour when the murderer accomplished his purpose these gates were open; indeed, according to the testimony of those living near, the entrance to the court is seldom closed." Morris Eagle interview: "The gates were thrown wide back. In fact it is very seldom that they are closed." Last edited by Joshua Rogan; 07-24-2018, 06:35 AM. I wondered about that too, but checking the contemporary sketches on Casebook they show no wicket gate in the Buck's Row gates. Last edited by Joshua Rogan; 07-24-2018, 06:37 AM. This is the only sketch that appears to show a wicket gate. 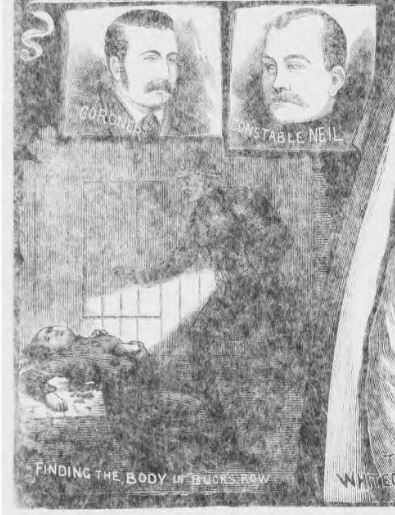 Illustrated Police News, 8 Sept.
Eddowes was found outside a gate too, but I have never seen a sketch showing a wicket door. The gate may not have been tall enough to justify one? Thanks for posting these JR and Richard. Its clear the gates were open and how the building was accessed. I would imagine that in the days and weeks after the murder, the gates were kept closed to exclude sightseers, even though they may have normally remained open. 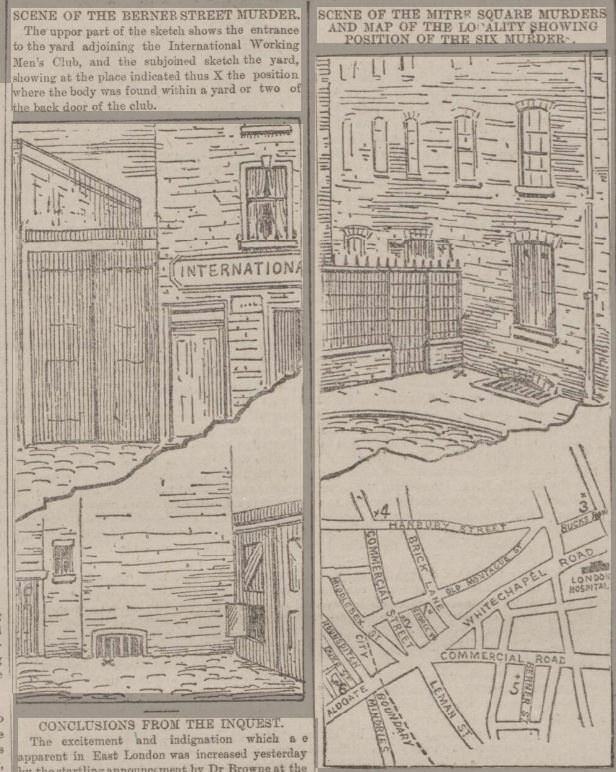 The members actually sold tickets to see the spot where the poor woman was murdered, they did so through the wicket door, which was the equivalent of a Victorian bank tellers configuration. I believe the contemporary name was a 'Judas Gate'. Are you sure that the phrase wasn't more or less invented by Jack Higgins for his novels? A "judas" (aka "judas hole" or "judas window") is a door in which an aperture has been cut for observing the person - usually a prisoner - inside; i.e. a spyhole or a peephole. This particular term has been in use since the early 19th Century. The rest of the discussion you posted shows there is some doubt about how widespread this phrase was. Perhaps it's use was popular on the streets of Yorkshire where he grew up, but doesn't seem to have made it into print very often, outside of his books. You may have better luck, but I can't find any mentions at all in Google books between 1850-1900 (Judas hole, yes, Judas gate, no) nor can I find any in the press reports here. Last edited by Joshua Rogan; 07-31-2018, 01:24 AM.